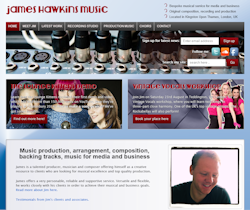 James is an up and coming music producer, with a niche in vocal production and choirs. He needed to build a brand for his business, showcase an online portfolio of his work including plenty of new music. In addition he needed a way to promote and sell tickets for choral workshops and events. He plans to expand both sides of the business, through using Social Media campaigns and digital tutorials. Cheryl has taken my business from being me and a studio, to having a brand, website and being able to publicise my work to a mailing list of several hundred people. I can run ticketed events, taking payments easily with Paypal and have learnt a whole raft of new techniques and tools in the Social Media world. Particularly I am now integrating SoundCloud, Twitter, YouTube and Pledge Music (a crowd sourcing platform) right into the core of my business. I want to continue making improvements and next year plan some branding and commercial improvements. Posted in Testimonials and tagged Branding, Contact form, Event Management, Mailchimp, Mailing List Sign Up, Music Producer, Paypal, Pledge Music, SoundCloud, Twitter, Web design, website design.